At the end of this month, electoral packages will begin to arrive at households in British Columbia. The 2018 Referendum on Electoral Reform will ask eligible voters two questions. In the first question, voters will select if we should hold our provincial elections with the current first-past-the-post system or with a different one that incorporates proportional representation. In the second question, voters will rank three possible proportional representation systems that could be adopted by the province. It is very difficult to make sense of how voters will behave at this time. In previous mail-in democratic processes, British Columbians had plenty of time and information to make up their minds. The needle did not move after the electoral packages were mailed to voters in both the provincewide 2011 sales tax referendum and the 2015 Metro Vancouver transit and transportation plebiscite. For this new mail-in ballot, the situation is different. Interested and engaged citizens are concentrating primarily on the municipal elections scheduled for October 20. In this scenario, campaigns will find it harder to establish an emotional connection with the electorate. In 2011 and 2015, there were easily identifiable recipients of voter anger (B.C. Premier Gordon Campbell and TransLink respectively) who were not on the ballot. The rival campaigns have started to court would-be voters with specific messaging. For the proponents of change, the prevailing concepts are dissatisfaction and fairness. For those who favour the status quo, it is all about protection and identity. How are British Columbians reacting to these early messages? A Research Co. poll sought to review the sentiments of the population toward four ideas that the contending groups have been advocating. First, the “Yes” side. In principle, British Columbians agree with the idea that proportional representation is fairer, because the proportion of votes received by each party will be roughly the same as the proportion of seats they hold in the legislative assembly. More than half of British Columbians (56 per cent) agree with this statement, including 77 per cent of those aged 18-to-34. Across the province, 47 per cent of residents say they are dissatisfied with the first-past-the-post system currently used to elect members of the legislative assembly, while a smaller proportion (41 per cent) are satisfied. 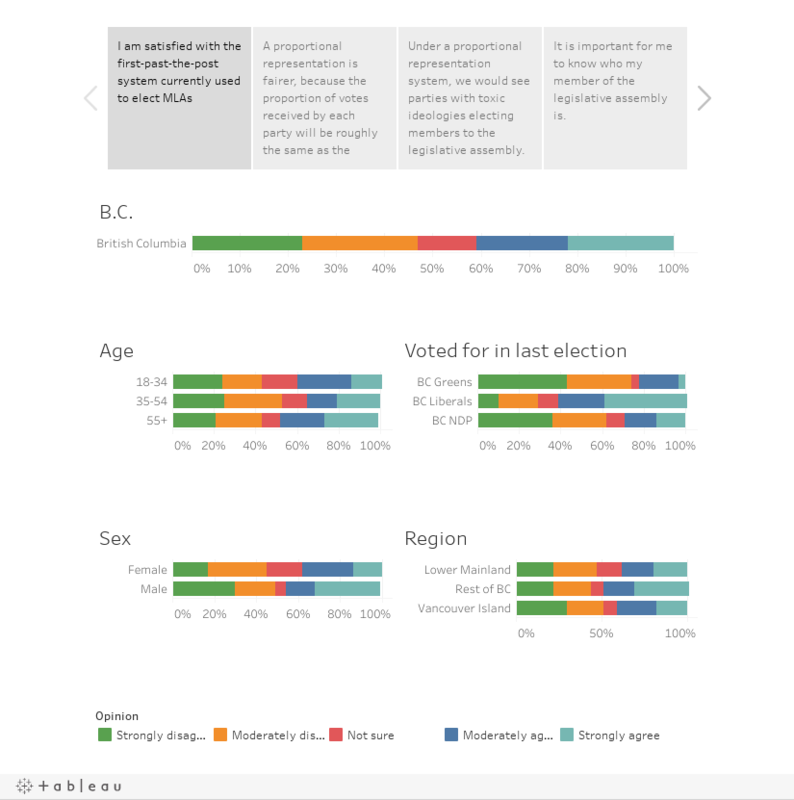 Satisfaction with the current electoral system is lowest among residents of the Lower Mainland (38 per cent) and increases slightly in Vancouver Island (41 per cent). In the rest of the province – areas that the “No” side has been particularly active in courting – satisfaction stands at 50 per cent. As expected, an overwhelming number of people who voted for the BC Liberals in the last provincial election (62 per cent) favour the first-past-the-post system, compared with just 29 per cent among those who voted for the BC New Democratic Party (NDP) in last year’s ballot. Among provincial BC Green Party voters, satisfaction with the current system plummets to 22 per cent. The pro-change messages get a mixed reaction from the public. Proportional representation is indeed regarded as fairer, but not overwhelmingly. And there is a marked generational divide on the merits of first past the post. Now, let’s look at the “No” side. A third of British Columbians (32 per cent) believe that under a proportional representation system, we would see parties with toxic ideologies electing members to the legislative assembly. A higher proportion of residents (42 per cent) disagrees with this purported consequence of electoral reform. The “toxic ideology” argument resonates more with British Columbians aged 55 and over (39 per cent) and drops drastically for those aged 35-to-54 (32 per cent) and those aged 18-to-34 (15 per cent). The key message for the status-quo proponents appears to be identity, with 82 per cent of British Columbians saying it is important to them to know who their member of the legislative assembly is. The idea of being locally represented by several people is not appealing to many voters, who want to know exactly which politician to voice their concerns to. The two campaigns have a lot of work to do. Millennials, upset at supporting parties whose members rarely win in their riding, are decidedly more likely to like the concept of proportional representation. Baby boomers are not as keen on switching systems, and see merits in keeping first past the-post. It may be up to generation X to act as a tie-breaker.